Developing resilience to changing climate and environmental factors is important, and our state needs a plan for that purpose. Together with Senator Marc Pacheco and others, I have been advocating for such a plan. On September 16, 2016, Governor Baker took decisive action on this front, by signing Executive Order 569, which among other things requires our state government to chart a course towards greater resilience. More recently, the legislature passed H.4835, "An Act promoting climate change adaptation, environmental and natural resource protection, and investment in recreational assets and opportunity," which also requires this type of planning and specified some of its components. I was a strong supporter and advocate of that legislation. 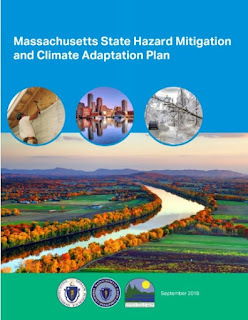 On Monday (9/17/18) we saw the first results of these efforts as Secretary Beaton and the Baker Administration released " The State Hazard Mitigation and Climate Adaption Plan (SHMCAP)," which is the product of many hours of discussions with state and federal agencies and individuals. The plan is an important tool to guide public policy and inform decisions.